The Sega Genesis Classics Collection has been available on Steam for several years now, offering a way to buy and play dozens of Genesis games on your modern computer without turning to the murky waters of unlicensed emulation. It was a pretty clumsy product, little more than an official and unintuitive version of the illicit programs people have been using for decades. But a few days ago, Sega completely revamped the Classics Collection. Now when you want to play Ristar, you can do so from a virtual living room, picking the game from your shelf of Genesis classics and plopping it into your digital console before it flickers to life on a fake TV. It’s a novel wrapper, for sure, but it’s nothing revolutionary. The real news here is that Sega also added Steam Workshop support for every game included in the collection. That means users from around the world can upload files that modify these decades-old games to a single, easy-to-access place, and anyone who wants to download and play one can do so with just a few clicks. There are already more than 150 items in the Workshop, and as to be expected, it’s a mix of cheat modes, wacky hacks, and plenty of dubious ephemera from the golden age of unlicensed video games. Many of the mods are innocuous fun. The “Chill Editions” of various games give you infinite health so you can breeze through them. There’s one that replaces all the dolphins in Ecco The Dolphin with orcas. (That one’s an older hack known as Ecco The Orca.) The recently released Sonic The Hedgehog Boom mocks Sega’s series reboot by inserting several of new-Sonic’s most cringeworthy lines into the original game and having them endlessly repeat. Other hacks are far more elaborate, replacing a game’s art, levels, and characters or building new games out of existing objects. But a quick glance through the available mods reveals an even weirder side. There are several unreleased prototypes of major games, like the earliest known version of Sonic The Hedgehog 2, which also happens to be the one contestants played on Nick Arcade. And then there are the unlicensed games. These are games that never went through Sega’s vetting process and were usually released in Asia and Europe. 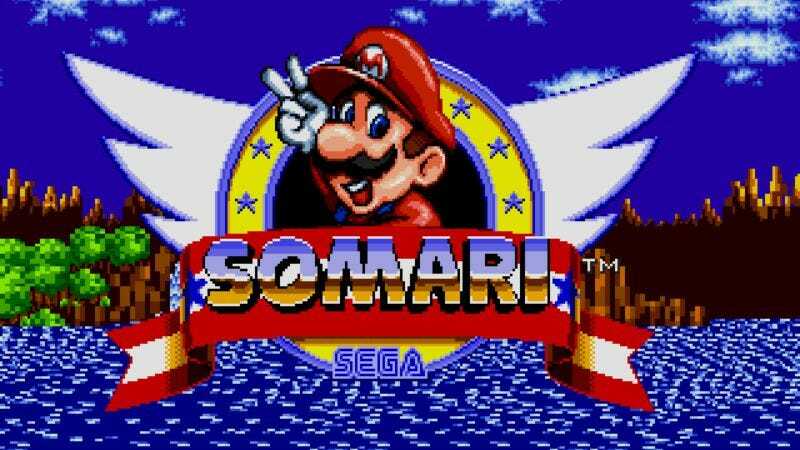 The most notorious of them steal elements from popular games, like Somari The Adventurer, which was originally an NES game that shoved Mario into Sonic The Hedgehog. A Genesis version of Somari, which hacks the ripoff back into Sonic The Hedgehog, is already up on the Workshop. As is Squirrel King, based on the NES’ Chip ‘N Dale game, and its copyright-infringing derivative, Super Mario World, which is worth playing for its hilariously not-quite-right take on the Mario theme song. The uploading of these unlicensed games and prototypes gets into fuzzy legal territory, but Sega has yet to pull them down. What has been removed are clear attempts at piracy, where users uploaded known, licensed Genesis games that weren’t already available for purchase. Most of these hacks and unlicensed games have been around for years, sitting in corners of the internet and waiting for emulation enthusiasts to find and play them. This creates some problems of its own—with people uploading mods they didn’t author, for example—but Sega’s willingness to open up these floodgates and allow this material to be easily found and played via an official product is an unprecedented move. It’s entirely possible the company sees the horrors it unleashed and tears the whole thing down. And that would be a shame, because this is a win for video game preservation and a step toward making emulation something that’s accepted by game makers as a viable way to sell and protect their art rather than a scourge to be demonized. (If you’re interested in hearing more about that topic, Frank Cifaldi’s talk from this year’s Game Developers’ Conference is a great place to start.) Even if Sega does decide to gut the Classic Collection Workshop, at least we’ll have gotten to experience the wonders of Streets Of Rage 2 Except It Makes That Weird Tim Allen Noise When People Die.